I’m heading to Mexico later this month and looking forward to returning to Oaxaca. My last and first trip there was several years ago and I’ve always wanted to return. The state and city, a UNESCO World Heritage site, of Oaxaca are located in the southern part of Mexico, about a five hour ride from Mexico City. Its diversified cultures include Zapotecs and Mixtecs. Oaxaca is also a prime location to experience Day of the Dead and is well known for its high quality crafts. 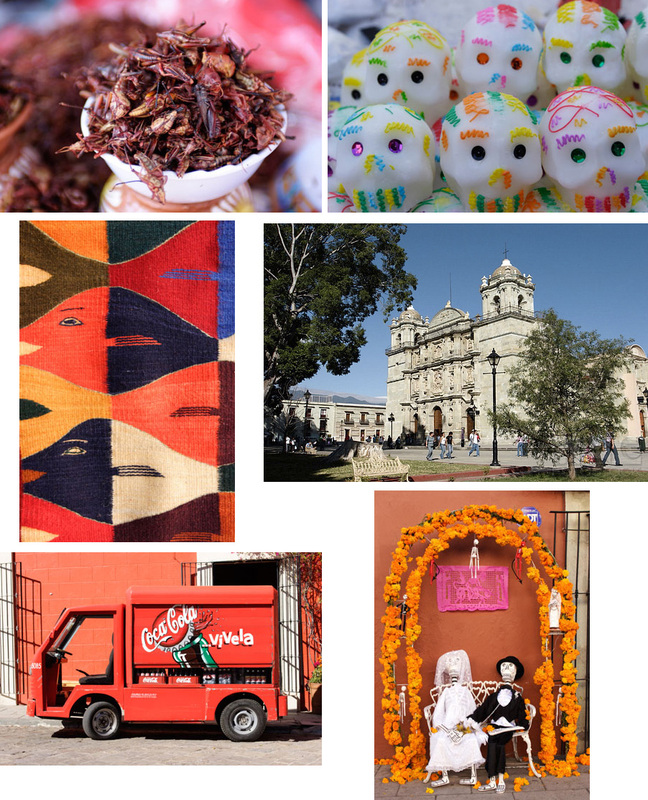 Pictured are local delicacy chapulines, sugar candy skulls, handicrafts, the zocalo and Day of the Dead folk art. These have appeared in newspapers, magazines, guide and textbooks. Which places would you like to visit again? Lovely Oaxaca! It's really an artisan paradise. I actually like to focus on travelling to as many different places as possible, it's rare that I think about returning to a specific place more than once. An exception would probably be Salvador, Brazil. I don't think anybody ever gets over it. I have been enough places to really worrying about going back. I agree with Fly Girl with so many places to visit you want to explore more. Or a least i do! I'd like to visit New York, Paris, London, Grenoble, and Zurich again. And Greece. Love this colourful collage, and would like to see Oaxaca myself at some point. By the way, I've photographed the same type of Coca Cola van here in Santiago. I went to Oaxaca for the first time at the end of December. Spent New Years eve and day there! I knew little about it before hand but want to go back as well! Gorgeous and photogenic city (as your photos attest)! Another stop in Mexico I'd like to see more of was Puebla. Our group stopped there for a night between Mexico City and Oaxaca and it seemed lovely from the little I got to see. Honestly, I've enjoyed most of the places I've been and always seem to find some place on a trip that haunts me a bit after. Fly Girl, It's hard not to love isn't it? Bluegreen, Indeed there are many places to see! Andrew, I love the retro look of the coca cola trucks. Mark, I'm heading to Puebla as well for the first time on this trip. Looking forward. I'm also haunted by places and return to quite a few repeatedly. Ah, the patterns and colours of Mexico. I love them!